Hi I’m Laurel, joining today from SoPo Cottage. I renovate old houses to give them updated amenities – but try to retain the classic, antique charm that these houses have. Our projects are typically 50-100 years old, so we’ve seen a lot of charm! If you want to see all of our projects, check out my blog here. We’re always working on a fun project! 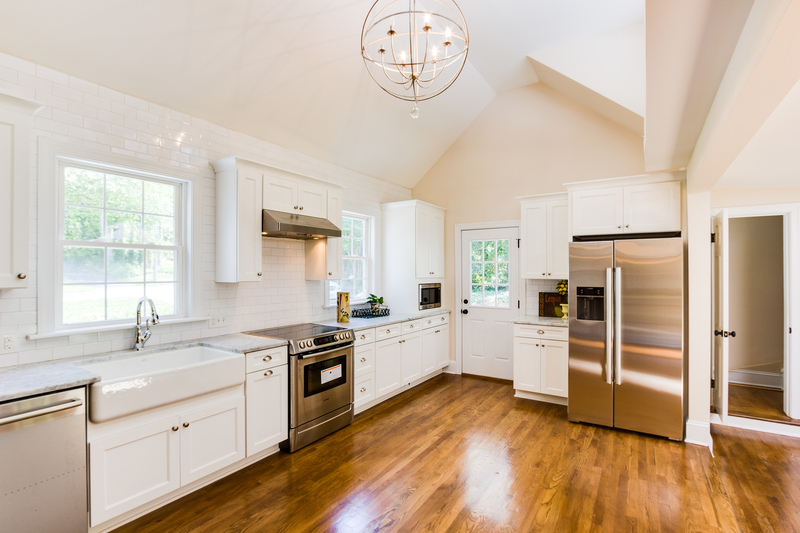 Recently, we did a top to bottom renovation of a 1927 bungalow. It had been well maintained over the years, but was ready for a few modern updates. A real plus was a good sized kitchen – but it was hidden in the back of the house and had a lot of wasted space. We changed all that by opening up the wall to the dining room and closing a wall to a rear hallway, creating a space for a new pantry. Our number one priority was to retain the original antique sink. We had it refinished and it’s the focal point of the room. Don’t you love the deep sink and integrated drain boards? We saved all the wood from the demolition work and wanted to use it in the kitchen. The first reclaimed wood project were these open shelves next to the sink. Next, we took old wall studs and turned them into a countertop for the kitchen island. They add so much character to the room, with their deep color and interesting texture. The rear wall of the kitchen went from a blank space to the cooking hub. And we highlighted the space with a custom hood for the stove. Want to see our DIY approach to the wooden hood? Check it out here. I found this old door at a local salvage yard and refinished it with original antique glass from a window we removed. Then I simply oiled the finish, to warm up the lustre of the antique wood and added an antique glass door knob. Removing the dining room wall made such a huge difference in the whole flow of the first floor! This is a new light fixture, but it provides such a nice retro touch to the room. This was a huge project that took us many months. But I’m thrilled with the outcome! Want to see the rest of the renovation? Check it out here! Remodelaholics, be sure to go visit SoPo Cottage and check out the rest of the bungalow renovation! Thanks so much for sharing our latest project!!! We loved taking the reclaimed wood from the house and turning into beautiful, functional elements of the updated kitchen! We adore your work, Laurel! Thanks so much for sharing! I am in love! I want that countertop and light fixture! Do you sell them, make me one???? PLEASEEEEEEEEEEEE!!!!??? Kitchen is sheer culinary perfection! Very nice, but that monstrously large refrigerator seems out of proportion to everything in the room.